Definition at line 21 of file APSInt.h. Definition at line 26 of file APSInt.h. Definition at line 30 of file APSInt.h. Definition at line 33 of file APSInt.h. Construct an APSInt from a string representation. This constructor interprets the string Str using the radix of 10. The interpretation stops at the end of the string. 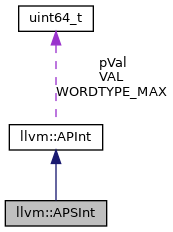 The bit width of the constructed APSInt is determined automatically. Str the string to be interpreted. Definition at line 20 of file APSInt.cpp. References APSInt(), assert(), llvm::StringRef::empty(), llvm::APInt::getActiveBits(), llvm::APInt::getMinSignedBits(), llvm::StringRef::size(), and llvm::APInt::trunc(). Definition at line 288 of file APSInt.h. References assert(), extend(), llvm::APInt::getBitWidth(), llvm::APInt::isNegative(), and isSigned(). Definition at line 84 of file APSInt.h. Definition at line 91 of file APSInt.h. Definition at line 313 of file APSInt.h. Definition at line 75 of file APSInt.h. getMaxValue - Return the APSInt representing the maximum integer value with the given bit width and signedness. Definition at line 269 of file APSInt.h. References llvm::lltok::APSInt, llvm::APInt::getMaxValue(), and llvm::APInt::getSignedMaxValue(). getMinValue - Return the APSInt representing the minimum integer value with the given bit width and signedness. Definition at line 276 of file APSInt.h. References llvm::lltok::APSInt, llvm::APInt::getMinValue(), and llvm::APInt::getSignedMinValue(). Definition at line 314 of file APSInt.h. Definition at line 283 of file APSInt.h. Definition at line 58 of file APSInt.h. Referenced by compareValues(), llvm::codeview::consume_numeric(), llvm::APFloat::convertToInteger(), createGlobalFwdRef(), llvm::codeview::CodeViewRecordIO::mapEncodedInteger(), llvm::operator<<(), and parseOptionalLinkageAux(). Definition at line 59 of file APSInt.h. Definition at line 236 of file APSInt.h. Definition at line 220 of file APSInt.h. Definition at line 154 of file APSInt.h. Definition at line 161 of file APSInt.h. Definition at line 114 of file APSInt.h. Definition at line 98 of file APSInt.h. Definition at line 251 of file APSInt.h. Definition at line 215 of file APSInt.h. Definition at line 255 of file APSInt.h. Definition at line 188 of file APSInt.h. Definition at line 196 of file APSInt.h. Definition at line 205 of file APSInt.h. Definition at line 202 of file APSInt.h. Definition at line 259 of file APSInt.h. Definition at line 192 of file APSInt.h. Definition at line 199 of file APSInt.h. Definition at line 210 of file APSInt.h. Definition at line 118 of file APSInt.h. Definition at line 106 of file APSInt.h. Definition at line 134 of file APSInt.h. Definition at line 170 of file APSInt.h. Definition at line 180 of file APSInt.h. Definition at line 183 of file APSInt.h. Definition at line 142 of file APSInt.h. Definition at line 164 of file APSInt.h. Definition at line 45 of file APSInt.h. Definition at line 51 of file APSInt.h. Definition at line 150 of file APSInt.h. Definition at line 158 of file APSInt.h. Definition at line 138 of file APSInt.h. Definition at line 173 of file APSInt.h. Definition at line 146 of file APSInt.h. Definition at line 167 of file APSInt.h. Definition at line 123 of file APSInt.h. Definition at line 126 of file APSInt.h. Definition at line 246 of file APSInt.h. Definition at line 230 of file APSInt.h. Definition at line 241 of file APSInt.h. Definition at line 225 of file APSInt.h. Definition at line 263 of file APSInt.h. Profile - Used to insert APSInt objects, or objects that contain APSInt objects, into FoldingSets. Definition at line 39 of file APSInt.cpp. Definition at line 61 of file APSInt.h. Definition at line 60 of file APSInt.h. Definition at line 64 of file APSInt.h. This is an inefficient method; you should prefer passing in a SmallString instead. Definition at line 69 of file APSInt.h. Definition at line 80 of file APSInt.h.